Hosting the Olympics requires an unending flow of cash. London spent $ 15 billion, China $ 44 billion. Isn’t India better off spending on athletes, rather than on Games? You knew India’s 2024 Olympics bid was cheeky overreach when early reports projected Ahmedabad as the host city. Even my over-eager Gujarati friends were more amused than excited. “Rowing at Kankaria Lake”, texted one. “Marathon on Rath Yatra route”, replied another. Archery at Motera, beach volleyball at Sabarmati… it went on until the humour ran stale. After a point, it wasn’t funny. You realised the joke was on you. International Olympic Committee (IOC) president Thomas Bach is a seasoned diplomat, he didn’t smirk when he said he was surprised by the speculation about the bid in India. “Just a year ago you (Indian Olympic Association) came out of suspension,” he gently reminded India. Meaning, get your house in order before beginning to dream big. Bach also called us “sleeping giants”. He wasn’t being sarcastic — actually, he can’t. 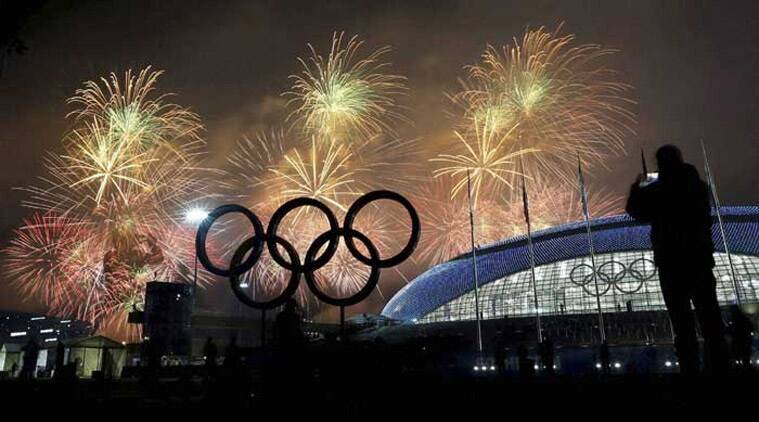 The IOC has historically had a soft corner for image-conscious nations with global aspirations. These ambitious countries are known to be big spenders, they are the perfect partners to sustain and enhance the global brand with rainbow rings. Berlin in 1936, Beijing in 2008 spent millions — and not just to celebrate the ancient Greek movement that urges the human spirit to go faster, higher, stronger. But the IOC also has standards and benchmarks. And Ahmedabad, Delhi, even India, are mere specks on the Olympic map, not real contenders to host the Games. If you have been watching Olympic opening ceremonies, you would know that. As India makes its blink-and-you-miss appearance, the commentator always says, “This is the nation that has won 6 straight hockey golds from 1928 to 1952.” That has been India’s sorry synopsis, our first impression to a global audience for the last six decades. Every host nation needs at least one sport that can be called its pedigree. India and hockey? The last medal was in 1980, we didn’t qualify in 2008, were 12th in 2012. Though, around the beginning of this millenium, the eyelids of the ‘sleeping giant’ have begun to quiver. After just four individual medals from 1900 to 1996, Indian athletes have won 11 from 2000 to 2012, with six of those in the last edition. But the largest-ever haul in 2012 could only put India at 55th place on the medals tally. Every host nation over the last four decades has finished in the Top 10. That puts things in perspective. India’s virtual non-existence in popular disciplines — athletics, swimming and gymnastics — also goes against it. In India, a near-miss in track-and-field can get you legendary status, even a biopic. But “finished 4th” at the Olympics — even if dripping with nostalgia — doesn’t make for good reading in a bid document. Let’s talk money now. India spends roughly $ 3 million on its athletes. USA spends $ 170 million, China $ 350 million. Hosting the Olympics requires an unending flow of cash. London spent $ 15 billion, China $ 44 billion. Isn’t India better off spending on athletes, rather than on Games? Heard the one about the length of the blanket and the stretching of the feet? India should know better. The pro-hosting lobby argues that the 2010 Commonwealth Games in Delhi was responsible for India’s Olympic medal spike at London 2012. The big sports budget, exposure trips, upgraded facilities and the nation’s attention on sports before CWG gave athletes the impetus to do well on the bigger stage two years later. Point taken. But this is too expensive a model to follow in the hunt for Olympic medals. You don’t bring the mountain home to learn mountaineering. The big medals haul was the reason why CWG injected enthusiasm in Indian athletes and excited the fans. Jawarharlal Nehru Stadium turned into an inspiring arena only because of the Indian relay girls’ gut-busting golden effort. Hosting the Olympics, even in 2024, would mean applauding foreign athletes. It will just drive home the point that we aren’t world class. Do we need to spend billions to know that? Maybe we should try the Asian Games. Time to wake up our good old sleeping giant Appu.